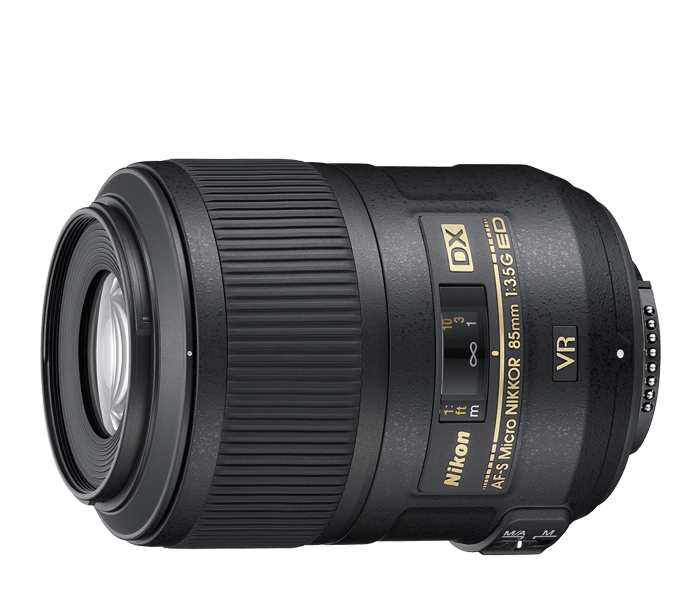 The compact AF-S DX Micro NIKKOR 85mm f/3.5G ED VR is ideal for extreme close-up and general photography. Nikon VR (Vibration Reduction) image stabilization provides 3.0 stops* of blur free handheld shooting, assuring dramatically sharper still images and HD video capture. Discover a world of unseen detail with stunning sharpness and beautiful background bokeh in close-up, nature, portrait and general photography applications. Optimized for DX-format cameras, the AF-S DX Micro NIKKOR 85mm f/3.5G ED VR delivers exceptional images, reproducing every detail in true-to-life brilliance thanks to a host of Nikon lens technologies. Silent Wave Motor (SWM) provides ultra-fast, ultra-quiet internal autofocusing from infinity to life-size (1:1 reproduction ratio). SWM also allows for seamless manual focus override—key when shooting live subjects like insects or flowers. Extra-low Dispersion (ED) glass elements provide superior sharpness and color reproduction, and Super Integrated Coating (SIC) virtually eliminates ghosting and lens flare.